(CNSNews.com) - The five richest counties in the United States when measured by median household income are all still suburbs of Washington, D.C., according to American Community Survey data released today by the Census Bureau. In fact, ten of the top twenty richest counties in the country are suburbs of Washington, D.C., according to this new data. 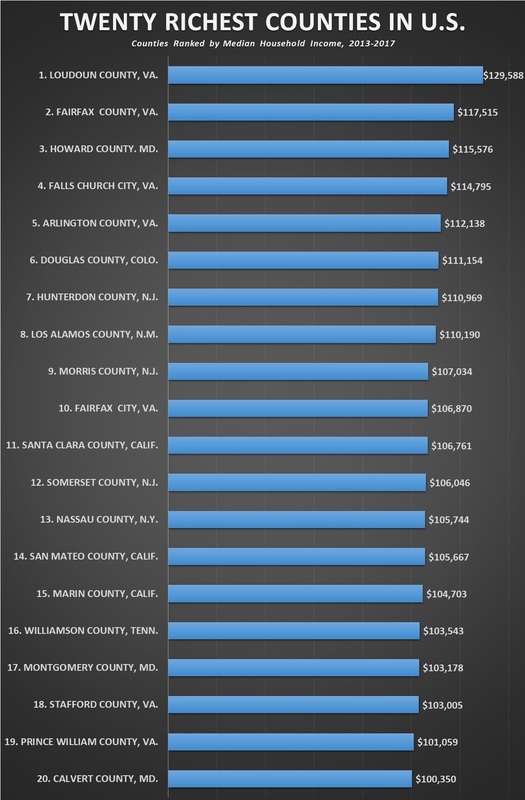 In the five-year estimates released last December (2012-2016), Falls Church City ranked second and Fairfax County and Howard County ranked third and fourth. The Census Bureau treats independent cities like Falls Church City as counties. The wealthiest county in the United States that is not a suburb of Washington, D.C. is Douglas County, Colo., which ranked No. 6 with a median household income of $111,154. Douglas County is south of Denver and north of Colorado Springs. Three New Jersey counties made the Top 20. Hunterdon County was No. 7 ($110,969); Morris County was No. 9 ($107,034); and Somerset County was No. 12 ($106,046). Three counties in the San Francisco Bay Area also made the Top 20. Santa Clara County was No. 11 ($106,761); San Mateo County was No. 14 ($105,667); and Marin County was No. 15 ($104,703). Los Alamos County, N.M., which is home to the U.S. Department of Energy’s Los Alamos National Laboratory, was No. 8 ($110,969).